You really need a liquidiser for both the soup and the wild garlic cream. A food processor won’t give you a velvety texture. If you only have a Magimix style food processor you might try passing the soup and cream (separately) through a sieve but that’s quite an effort. Wild garlic is only around for a few weeks in the spring, so out of season either leave out the cream or substitute baby spinach and a bunch of chives for the wild garlic. The wild garlic cream could also be served as a sauce for fish (lovely with some hake or halibut) or roast chicken. Bring a saucepan of water to the boil and blanch the wild garlic for 40 seconds. Drain and immediately refresh in cold water. Drain the wild garlic again and squeeze dry. Put in a liquidiser. Heat the butter in a small saucepan and sauté the shallot for 5-6 minutes until softened but not coloured. Pour in the cream and bring to the boil. Take off the heat and leave to cool a little before pouring into the liquidiser. 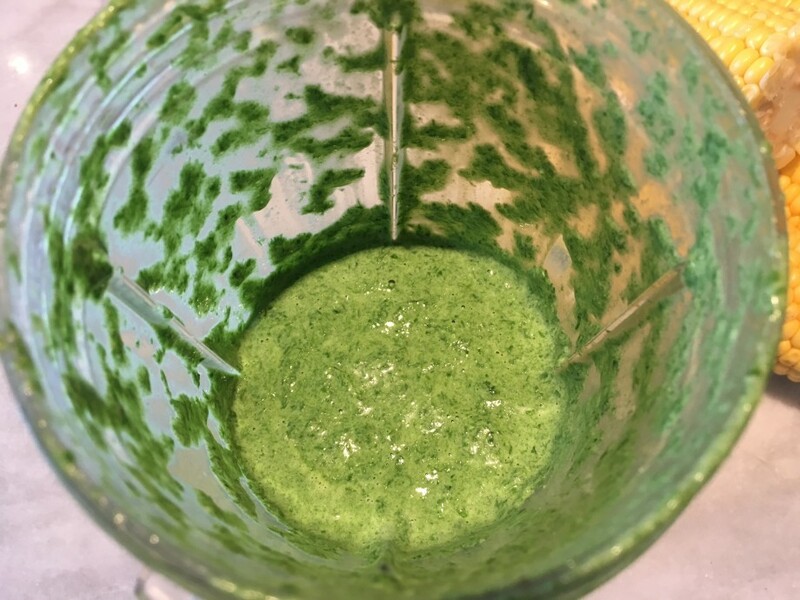 Blend with the wild garlic until completely smooth. Taste and season well with salt and ground black pepper. Pour into a serving dish and set aside. Remove the kernels of corn from the cobs by standing them upright on a board and cutting down the sides. 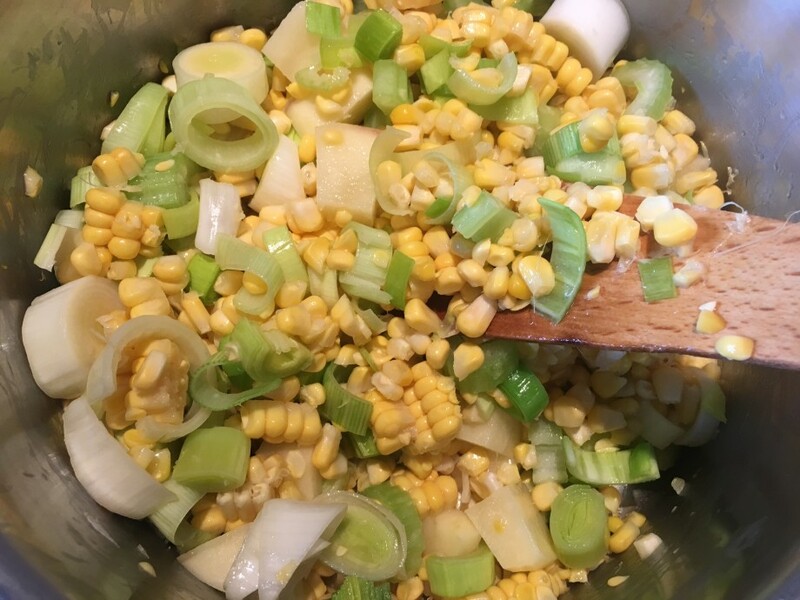 Heat the oil in a large saucepan and add the corn kernels, leeks, celery and potato. Stir over a moderate heat for 15 minutes. Pour in the stock and bring to the boil. Simmer for about 20 minutes until the vegetables are soft. Cool before liquidising. To serve, heat to just below boiling point. 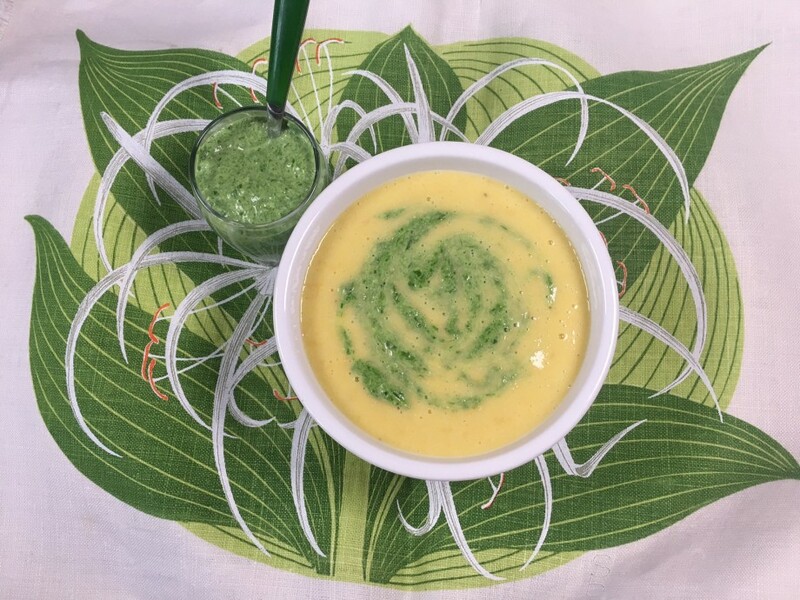 Pour into serving bowls and swirl in a good tablespoon of the wild garlic cream.